The crew of Southwest Airline flight 13-80 was honored by President Trump at the White House on Tuesday for safely landing in Philadelphia after one of its engines exploded. President Donald Trump lauded the Southwest Airlines crew for landing Flight 1380 after an engine exploded over Pennsylvania and killed a passenger partially sucked out of a window. Trump welcomed the five-person crew and several passengers to the White House on Tuesday. The president praised Capt. Tammie Jo Shults, one of the U.S. Navy's first woman fighter pilots, and first officer Darren Ellisor for doing an "incredible" job successfully landing the crippled Boeing 737 jet at Philadelphia International Airport on April 17. Asked if Ellisor was a "pretty good" co-pilot, Schultz told the president he is "excellent." Flight attendants Rachel Fernheier, Seanique Mallory and Kathryn Sandoval told Trump they were not nervous during the emergency landing in Philadelphia and the president praised them for showing great leadership. "They said you were calm, and strong and cool, thank you very much," Trump said. The New York-to-Dallas-bound flight was forced to make an emergency landing after the plane's left engine exploded at 32,000 feet, sending debris careening into the fuselage and causing a window to shatter. The plane violently depressurized and the passenger sitting next to the window, Jennifer Riordan, was partially sucked outside. Passengers Tim McGinty and Andrew Needum, a firefighter from Celina, Texas, pulled Riordan back inside the plane and Peggy Phillips, a retired nurse, began performaing CPR on the gravely injured woman. Trump thanked McGinty and Needum Tuesday for risking their lives to save Riordan and commended Phillips for adminstering CPR until the plane landed in Philadelphia. "While there was nothing more that they could do, these American responded with tremendous bravery," Trump said. "The actions of the crew and passengers of Southwest Flight 1380 show the great character of our nation. We're very, very proud of them and God bless you all." 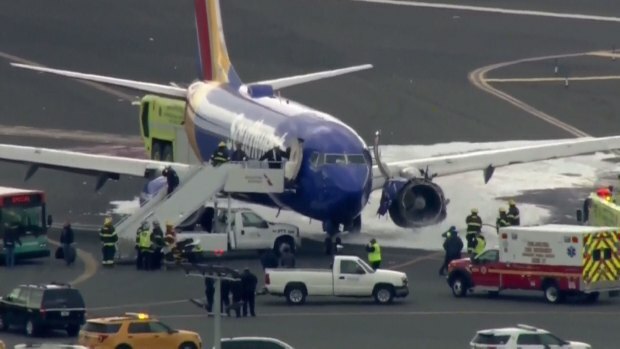 A Southwest flight headed from New York to Dallas made an emergency landing at Philadelphia International Airport Tuesday morning. This interview is with Todd Baur, who said he spoke to his daughter-in-law who was on the plane. Riordan, a wife and mother of two from New Mexico, died from injuries she suffered in the incident. Several others on the flight carrying 144 passengers were injured. Trump said "our hearts break" for the passenger who was killed." Federal investigators believe fractures in a engine fan blade caused it to break apart and prompt the explosion. The FAA has since issued a directive ordering the inspection of all engines of the same make currently in operation. The NTSB investigation is ongoing.